A. Name and Definition. — The Mass is the complex of prayers and ceremonies that make up the service of the Eucharist in the Latin rites. As in the case of all liturgical terms the name is less old than the thing. From the time of the first preaching of the Christian Faith in the West, as everywhere, the Holy Eucharist was celebrated as Christ had instituted it at the Last Supper, according to His command, in memory of Him. B. The Origin of the Mass. — The Western Mass, like all Liturgies, begins, of course, with the Last Supper. What Christ then did, repeated as he commanded in memory of Him, is the nucleus of the Mass. As soon as the Faith was brought to the West the Holy Eucharist was celebrated here, as in the East. C. The Mass from the Fifth to the Seventh Century. — By about the fifth century we begin to see more clearly. Two documents of this time give us fairly large fragments of the Roman Mass. D. From the Seventh Century to Modern Times. — After Gregory the Great (590-604) it is comparatively easy to follow the history of the Mass in the Roman Rite. E. The Present Roman Mass. — It is not the object of this paragraph to give instruction as to how the Roman Mass is celebrated. The very complicated rules of all kinds, the minute rubrics that must be obeyed by the celebrant and his ministers, all the details of coincidence and commemoration -- these things, studied at length by students before they are ordained, must be sought in a book of ceremonial (Le Vavasseur, quoted in the bibliography, is perhaps now the best). Moreover, articles on all the chief parts of the Mass, describing how they are carried out, and others on vestments, music, and the other ornaments of the service, will be found in THE CATHOLIC ENCYCLOPEDIA. It will be sufficient here to give a general outline of the arrangement. The ritual of the Mass is affected by (1) the person who celebrates, (2) the day or the special occasion on which it is said, (3) the kind of Mass (high or low) celebrated. But in all cases the general scheme is the same. The normal ideal may be taken as high Mass sung by a priest on an ordinary Sunday or feast that has no exceptional feature. That the Mass, around which such complicated rules have grown, is the central feature of the Catholic religion hardly needs to be said, During the Reformation and always the Mass has been the test. The word of the Reformers: "It is the Mass that matters", was true. The Cornish insurgents in 1549 rose against the new religion, and expressed their whole cause in their demand to have the Prayer-book Communion Service taken away and the old Mass restored. The long persecution of Catholics in England took the practical form of laws chiefly against saying Mass; for centuries the occupant of the English throne was obliged to manifest his Protestantism, not by a general denial of the whole system of Catholic dogma but by a formal repudiation of the doctrine of Transubstantiation and of the Mass. As union with Rome is the bond between Catholics, so is our common share in this, the most venerable rite in Christendom, the witness and safeguard of that bond. 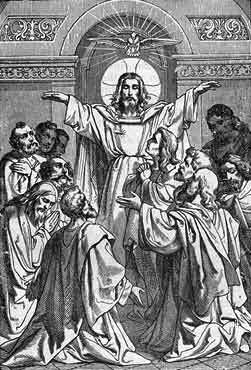 It is by his share in the Mass in Communion that the Catholic proclaims his union with the great Church. As excommunication means the loss of that right in those who are expelled so the Mass and Communion are the visible bond between people, priest, and bishop, who are all one body who share the one Bread. Liturgy. — The various Christian liturgies are described each under its own name. (See ALEXANDRINE LITURGY; AMBROSIAN LITURGY; ANTIOCHENE LITURGY; CELTIC RITE; CONSTANTINOPLE, RITE OF; GALLICAN RITE; JERUSALEM, LITURGY OF; MOZARABIC RITE; SARUM RITE; SYRO-JACOBITE LITURGY.) In this article they are considered only from the point of view of their relation to one another in the most general sense, and an account is given of what is known about the growth of a fixed liturgy as such in the early Church. I. DEFINITION. — Liturgy (λειτουργια) is a Greek composite word meaning originally a public duty, a service to the state undertaken by a citizen. Its elements are λειτος (from λεως = λαος, people) meaning public, and εργω (obsolete in the present stem, used in future ερξω, etc. ), to do. From this we have λειτουργος, 'a man who performs a public duty', 'a public servant', often used as equivalent to the Roman lictor; then λειτουργεω, 'to do such a duty', λειτουργημα, its performance, and λειτουργια, the public duty itself. At Athens the the λειτουργια was the public service performed by the wealthier citizens at their own expense, such as the office of gymnasiarch, who superintended the gymnasium, that of choregus, who paid the singers of a chorus in the theatre, that of the hestiator, who gave a banquet to his tribe, of the trierarchus, who provided a warship for the state. The meaning of the word liturgy is then extended to cover any general service of a public kind. In the Septuagint it (and the verb λειτουργεω) is used for the public service of the temple (e. g., Ex., xxxviii, 27; xxxix, 12, etc.). Thence it comes to have a religious sense as the function of the priests, the ritual service of the temple (e. g., Joel, i, 9; ii, 17, etc.). In the New Testament this religious meaning has become definitely established. In Luke, i, 23, Zachary goes home when 'the days of his liturgy' (αι ηυεραι της λειτουργιας αυτου) are over. In Heb., viii, 6, the high priest of the New Law 'has obtained a better liturgy', that is a better kind of public religious service than that of the Temple. So in Christian use liturgy meant the public official service of the Church, that corresponded to the official service of the Temple in the Old Law. We must now distinguish two senses in which the word was and is still commonly used. These two senses often lead to confusion. On the one hand, liturgy often means the whole complex of official services, all the rites, ceremonies, prayers, and sacraments of the Church, as opposed to private devotions. In this sense we speak of the arrangement of all these services in certain set forms (including the canonical hours, administration of sacraments, etc. ), used officially by any local church, as the liturgy of such a church — the Liturgy of Antioch, the Roman Liturgy, and so on. So liturgy means rite; we speak indifferently of the Byzantine Rite or the Byzantine Liturgy. In the same sense we distinguish the official services from others by calling them liturgical; those services are liturgical which are contained in any of the official books (See LITURGICAL BOOKS) of a rite. In the Roman Church, for instance, Compline is a liturgical service, the Rosary is not. The other sense of the word liturgy, now the common on in all Eastern Churches, restrict it to the chief official service only — the Sacrifice of the Holy Eucharist, which in our rite we call Mass. This is now practically the only sense in which λειτουργια is used in Greek, or in its derived forms (e. g., Arabic al-liturgiah) by any Eastern Christian. When a Greek speaks of the "Holy Liturgy" he means only the Eucharist Service. For the sake of clearness it is perhaps better for us too keep the word to this sense, at any rate in speaking of Eastern ecclesiastical matters; for instance, not to speak of the Byzantine canonical hours as liturgical services. Even in Western Rites the word "official" or "canonical" will do as well as "liturgical" in the general sense, so that we too may use Liturgy only for the Holy Eucharist. It should be noted also that, whereas we may speak of our Mass quite correctly as the Liturgy, we should never use the word Mass for the Eucharistic Sacrifice in any Eastern rite. Mass (missa) is the name for that service in the Latin Rites only. It has never been used either in Latin or Greek for any Eastern rite. Their word, corresponding exactly to our Mass, is Liturgy. The Byzantine Liturgy is the service that corresponds to our Roman Mass; to call it the Byzantine (or, worse still, the Greek) Mass is as wrong as naming any other of their services after ours, as calling their Hesperinos Vespers, or their Orthros Lauds. When people go even as far as calling their books and vestments after ours, saying Missal when they mean Euchologion, alb when they mean sticharion, the confusion becomes hopeless. Rite, "Ritus in classical Latin, means primarily the form and manner of any religious observance, so Livy, 1, 7: 'Sacra diis aliis albano ritu, græco Herculi ut ab Evandro instituta erant (Romulus) facit'; then, in general, any custom or usage. In English the word 'Rite' ordinarily means, the ceremonies, prayers, and functions of any religious body, whether pagan, Jewish, Moslem, or Christian. But here we must distinguish two uses of the word. We speak of any one such religious function as a rite -- the rite of the blessing of palms, the coronation rite, etc. In a slightly different sense we call the whole complex of the services of any Church or group of Churches a rite-thus we speak of the Roman Rite, Byzantine Rite, and various Eastern rites. In the latter sense the word is often considered equivalent to liturgy, which, however, in the older and more proper use of the word is the Eucharistic Service, or Mass; hence for a whole series of religious functions 'rite' is preferable." "A Christian rite, in this sense comprises the manner of performing all services for the worship of God and the sanctification of men. This includes therefore: (1) the administration of sacraments, among which the service of the Holy Eucharist, as being also the Sacrifice, is the most important element of all; (2) the series of psalms, lessons, prayers, etc., divided into unities, called 'hours', to make up together the Divine Office; (3) all other religious and ecclesiastical functions, called sacramentals. This general term includes blessings of persons (such as a coronation, the blessing of an abbot, various ceremonies performed for catechumens, the reconciliation of public penitents, Benediction of the Blessed Sacrament etc. ), blessings of things (the consecration of a church, altar, chalice, etc. ), and a number of devotions and ceremonies, e.g. processions and the taking of vows. Sacraments, the Divine Office, and sacramentals (in a wide sense) make up the rite of any Christian religious body. In the case of Protestants these three elements must be modified to suit their theological opinions." "In the same sense we distinguish the official services from others by calling them liturgical; those services are liturgical which are contained in any of the official books of a rite."